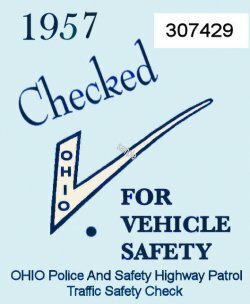 1957 Ohio Safety check sticker - $20.00 : Bob Hoyts Classic Inspection Stickers, Add a Final Touch to your Restoration! This 1957 sticker was issued when a roadside inspection turned up bad equipment. When the owner repaired the flaw the garage placed a sticker on the car. For an additional $10.00 we can remove the serial number and insert your license plate number. This sticker was carefully restored both front and back from a very nice original.